I recently got an srs and my boys & girls are yet to move in so i'm doing a lot of research on good layouts etc. Basically i hate substrate and would really prefer not to have it. I use finacard and they just wee over it & it just clumos at the bottom of the cage. They don't dig in it, or use it for nests because they get shredded paper for that. I was thinking that i could just place a shoebox or something full of it in the cage and then if they want it they can drag it out, but is this a bad idea? If i remove substrate do i need to out sheets of newspaper on the base or anything? I thought it would be nice to have the base just the plastic so it's easier to wipe down & reduce smell. Plus if substrate was mostly in a box it would be easier to replace & reduce stink, especially since one boy & one girl get really sneezy by clean out day with all the stink, even tho i clean them out every 5/6 days. Does anyone not use substrate at all? Substrate is quite important, its there for a number of reasons, the first is to absorb the urine away from the surface so rats don’t have to walk in it and also reducing the smell. Solid surfaces without covering have been linked to bumble foot as the foot can end up sat in urine. Even if you wipe daily I suspect this will end up more smelly and not good for them. An alternative that some people use is to cover the floor with fleece or towels, this does look pretty and does absorb away the worst of the urine and can be machine washed along with your hammocks. 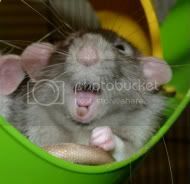 Personally though I feel depriving rats of stuff to dig in is a real shame. I know you think your rats don’t dig, however they may dig when you are not around. Or if you offered them an incentive to dig they would get a lot more out of it (like scatter feeding). Digging is a very natural ratty behaviour and helps keep them active and fit as well as mentally stimulated so in my mind should be strongly incouraged. Some people use fleece, could that be an option for you? Having a decent layer of substrate is also better if you do active cage layouts as it provides a layer that absorbs impact should they jump into the base (or otherwise ). What cage are you using at the moment? You may find that once they move into the SRS it doesnt smell as much anyway because its so big it wont be as concentrated. I didnt used to use any substrate, I just had fleece on all the levels and I had to clean it twice a week because it just held the pee and it got stinky pretty quickly. Now I've got them in an explorer and I use substrate I only clean them once a fortnight (with spot cleaning when needed), on occasion I've left it a further week without it being a problem. I scatter feed my boys, so they have to dig or they dont get to eat , I assume yours have a food bowl? I personally wouldnt go back to not using substrate both me and my boys much prefere it. I scatter feed, but not on the base, i use a smaller tray as i didn't want to put food where they do the majority of their weeing. They're in furet plus' at the min, and someone else mentioned that extra space might reduce the problem, so hopefully. I'll have a look around at other substrates then, i hate finacard. I am using auboise at the moment. It keeps the smell down, the food mixes in well for scatter feeding and they seem to do really well on it. redrach wrote: I scatter feed, but not on the base, i use a smaller tray as i didn't want to put food where they do the majority of their weeing. They're in furet plus' at the min, and someone else mentioned that extra space might reduce the problem, so hopefully. I'll have a look around at other substrates then, i hate finacard. I'd imagine if you didn't have any substrate on the cage floor it would get absolutely covered with poo and wee within hours and poos stuck to the bottom are really hard to clean off... that's one of the reasons substrate is important I think, poo and wee gets stuck to that, which you can just tip out, leaving the base to only need a quick wash and rinse. Having seen what a group of rats can do to a plastic shelf in a matter of hours imagine I dread to think what they'd do to a cage floor. There'd be nothing to soak up smells either. I think it would be much, much harder to keep clean in the long run. Hi there.....have you tried either Back2Nature or Papelit on the base and then top with Finacard ? I find it works really well. The rats like it and they can dig as much as they like...I just `fluff` it up now and again and I find that now I only have to clean out every two weeks instead of every other day with newspaper....There is never a smell. I spot clean daily and change hammocks about three times within the two weeks....The cage would go longer if I wanted. Dilip from Finacard is a member here and if you wanted to try the Papelit with the Finacard I think he would pop in a sample for you to try next time you order...he is a really nice guy and worth a PM to see if he can help. I`ve just changed over to Finacard which I put on top of B2N and I like it....good luck ! In my explorer I use Vetbed at the top (copes with wee a lot better than fleece and lasts longer) and they have a digging tray in the bottom half. Unfortunately since they all fell out, they have half each at the moment (until appropriate nuts are removed) so I alternate between who has the digging and who doesn't. In both cases, because they get under the vet bed and because the tray doesn't fit snugly, they end up peeing and pooing on the bases - and it does get pretty yucky. Before the current arrangement I used newspaper a couple of times, which they enjoyed trashing, but then you still got the goo on the base issue (and the newsprint wasn't kind on the white ones!). I'm hoping to get two deep fitted trays so I can have substrate and scatter feed on both levels (when the group is back together) - although I may still put vetbed in occasionally for a change in surface. I'd certainly never put them on bare bases, because they do just get utterly foul and smelly really fast. They have so much fun digging and making a mess, I'm definitely always going to offer at least one floor of substrate. Although you may not like it, they probably have different ideas! As others have said, it might be worth trying a different type of card and see if you like that any better. Bare bases are smelly and a bum to clean. I use fleece on all shelves and bases of my explorer with various boxes and trays and tunnels ect filled with finnacard or carefresh or newspaper to give them some variation in textures. I have found my cage smells far less now with the fleece as I just pull it all out every 10days or so to wash. It prob helps that I only have 2 girls in a huge cage and once the fleece went down they both decided that mom was serious about them using the 4 litter trays in the cage Now I scoop the trays twice a day and empty them every other, before the little darlings had a wonderful habbit of pooping through the bars or trampelling it between the base and the bars.